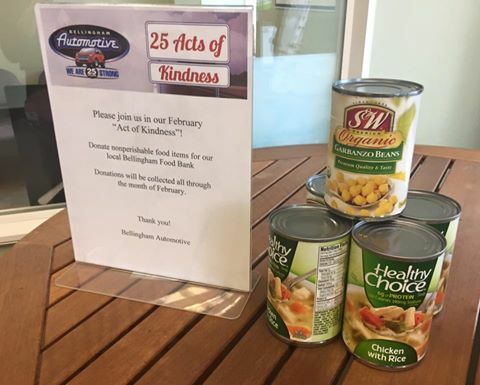 As part of our 25 Acts of Kindness to Celebrate our 25 years in business we are collecting nonperishable food donations for the Bellingham Food Bank. During the month of February we are giving back to you a little something sweet as a thank you for being a customer of Bellingham Automotive, stop in to see the surprise! In conjunction with sharing a sweet treat with you, we will also be collecting donations for the Bellingham Food Bank. Feel free to bring in your donations when you drop off or pick up your vehicle or just stop in, we’d love to see you! Our staff will also be bringing in non-perishable items and helping us to support our local community who has been there for us during the past 25 years. Bellingham Automotive, where customers become friends, and friends become family for 25 years! Donations can be dropped off and at our shop until the end of February. Thank you for helping us to continue to give back to our wonderful community.